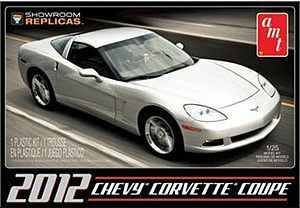 This is the 1/25 scale 2012 CORVETTE COUPE plastick model automobile kit by AMT. Retail $24.95 SAVE 59% ! This is a very good and nice mobel kit it is very detailed and has a nice modern and I love the wheels. Black vinyl seats and tires. Super detailing decal sheet with emblems, gauges and more. "For the price its Great"
"Easy Kit for an 8yr Old"
This Kit was bought for my grandson, who is just beginning glue together models. He is 8yrs old and had it put together in 2 days 1 day for the model - 1 day to help him with painting the body. I would recommend this kit for any beginner just starting out It would have been nice to have a drive train so it would be more realistic but you get what you pay for. I really hope this is not the coming trend with AMT they normally put out a good product.